Everyone agrees about the toughest sales problem today — customers are mostly through the buy cycle before they contact a supplier. There is less opportunity for a sales person to engage the customer during their research phase. It is harder to influence the buying decision by getting involved early in the game. 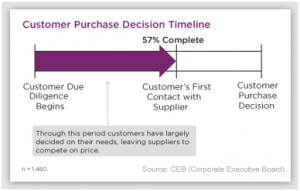 CEB's research, as reported by Jason Robinson at MarketBridge, shows that B2B customers are 57% of the way through the buying decision before the direct contact. This is hard to swallow for traditional sales organizations. It means that their influence is diminished. Even worse, the cost of sales is skyrocketing. It takes twice as many calls to qualify a prospect as it did three years ago. As Jason points out, buyers do not want to deal with sales people anymore. They would rather do their learning at their own pace. The solution? Enable your sales team with the ability to create custom print catalogs. It is a friendly way to reach the customer, and to do so long before a sales call would be accepted or wanted. At the first sign of interest, such as a downloaded white paper, the sales person can create a targeted publication containing relevant products, other useful content, and contact information. Whether delivered as a printed publication or as an emailed link to a PDF, it will be received as a helpful service. This is in sharp contrast to an unwanted sales call. It also serves to create and foster a relationship where none would have existed otherwise. The customer will be more inclined to pick up the phone if they have been genuinely assisted in their research. The approach works throughout the sales cycle. With each interaction, the sales person learns more about the requirements and direction of the project. They can respond with more refined and appropriate publications. It also works for going up or down the chain of decision-makers. A print publication is something that can be easily shared with colleagues and management. It does not disappear with the click of a mouse, and offers exposure that is unattainable any other way. A custom publication is perceived as going the extra mile. It is a door-opener.